Submitted by mark on Sunday, February 4th, 2018 at 9:19 am. 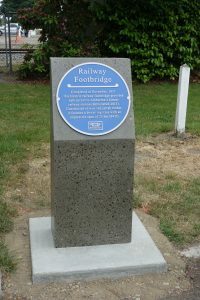 The Blue Plaque on its concrete plinth. Historic Places Mid Canterbury (HPMC) unveiled their first Blue Plaque. The Blue Plaque celebrates 100 years of the iconic Ashburton Railway Pedestrian Footbridge. The Blue Plaque is an initiative of HPMC and expect to see more of them as they start to market the project around the country.